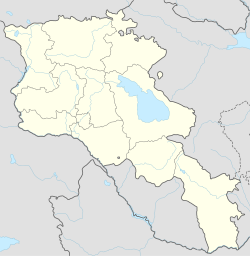 Artashat (Armenie: Արտաշատ; Hellenisit as Artaxata: Greek: Ἀρτάξατα), is a ceety on Araks River in the Ararat valley, 30 km sootheast o Yerevan. Being ane o the auldest ceeties o Armenie, Artashat is the caipital o Ararat Province. Modren Artashat is situatit on the Yerevan-Nakhichevan-Baku an Nakhichevan-Tabriz railwa an on Yerevan-Goris-Stepanakert heich-gate. The name o the ceety is derived frae Iranian leids an means the "joy o Arta". Foondit bi Keeng Artashes I in 176 B.C., Artashat servit as the caipital o the Kinrick o Armenie frae 185 BC till 120 AD, an wis kent as the "Vostan Hayots" or "court" or "seal o the Armenies." Present-day Artashat is a mid-sizit ceety an haes a population o 25,300 fowk. It is locatit 5 km northwast frae historical Artashat. ↑ 1.0 1.1 1.2 Hewsen, Robert H. Artaxata. Iranica. Accessed February 25, 2008. ↑ (in Armenie) Tiratsyan, Gevorg. «Արտաշատ» (Artashat). Armenian Soviet Encyclopedia. vol. ii. Yerevan: Armenian Academy of Sciences, 1976, pp. 135-136. This page wis last eeditit on 11 Mairch 2018, at 00:03.